Sometimes things just work out to your favor. This was the case for my Rapid Deployment Amateur Radio (RaDAR) Challenge outing on Saturday April 1st. I chose St. George Island State Park in Florida. This is a beautiful park with beaches on the South side and bay front access on the North side. The weather was stellar with clear blue skies. Contrast that with Julian OH8STN operating RaDAR in Finland. He endured freezing rain but still had a good time. The beach on the South side of St. George Island. I thank Eddie ZS6BNE of South Africa for originating RaDAR. The RaDAR Challenge now occurs the first Saturday of April, the third Saturday of July and the first Saturday of November each year. I have been participating since April 2013. The RaDAR challenge is a 4 hour stress test for your portable equipment and operating skill. In the Challenge, you make five contacts and move to another location. The distances vary by the transportation mode. I was on foot which is requires one kilometer. 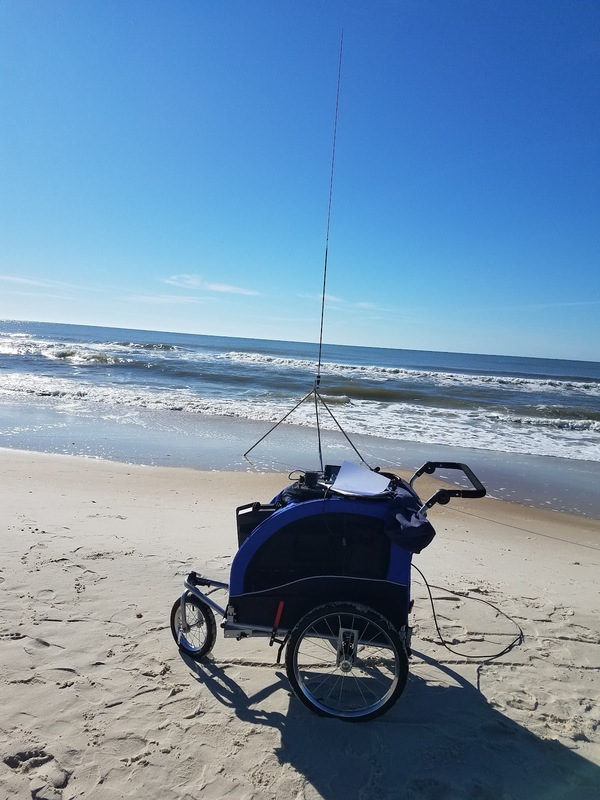 I chose to use my Icom 7100 for the expected difficult conditions. The battery and rig are heavy but a dog stroller I have made moving the gear very easy. Picnic area on the North side of St. George Island. Eddie was not able to practice RaDAR on foot this year. He recently was bitten on the foot by a large dog while jogging. However, Eddie was operating portable and focusing on RaDAR DX. That influenced me to choose St George Island. I subscribe to the salt water effect. This is that low angle radiation is enhanced for vertically polarized antennas at the shoreline or over saltwater. St George Island has a clear shot toward South Africa over the Gulf. My first stop was on the beach. I had a schedule prearranged to walk through the bands on CW from 10 meters to 20 meters. I could not hear Eddie. He could hear me but I was too weak to work. However, I did QSO with Eddie's friend John Kramer ZS5J on 15 and 17 meters. I still needed five contacts to move. Then I worked Rubin AC2RJ on 20 meters. I was unaware he was chasing me but that QSO helped get the five. He made a RaDAR video from his end. On my second stop, I set up my low dipole on forty meters. That enabled me to work chasers close by. That included Mike KM4ELJ near Panama City and Tom WD0HBR in Dothan, Alabama. A pleasant surprise was Craig NM4T The Huntsville QRP Guy. He worked me from his home in Alabama. It just happened that April 1st was the Florida State Parks On The Air Contest sponsored by the Lakeland ARC. I made a string of 16 contacts that counted toward that contest. 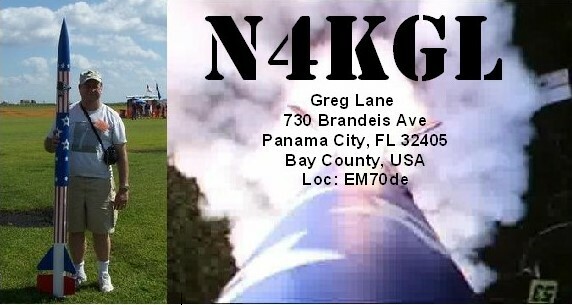 I worked two other Florida State Parks including K4LKL which was the bonus station for the contest. The operator was a friend Matthew KK4FEM. I timed my third stop to coincide with a SO 50 pass. Making a satellite pass counts toward a bonus for the RaDAR Challenge. I envisioned getting my five contacts all on the pass. The sat was so busy that I lucky to get one contact. Matthew KK4FEM came through for me. I picked up the remaining four on 20 SSB using the low dipole measured out for the band. This completed the four hours. But there is more. The World Wide Fauna and Flora program for the USA, WWFF-KFF, has awards for radar. making three transitions in 24 hours qualifies for a Warthog award, four is the Rhino award and six for the Cheetah award. I had enough for the Warthog but one more stop would give me the Rhino. So another one kilometer walk and I got five contacts on 20 CW. Two were WWFF chasers from Croatia. See my Rhino Award here. But there is more. On the way home, I passed by a small Florida State Park where the Florida Constitution Museum is located. I spent one hour there and got ten contacts. That is enough for a WWFF-KFF activation. 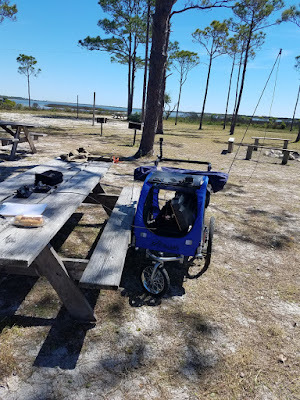 I certainly was blessed with a wonderful day to practice RaDAR, the Florida State Parks On the Air and World Wide Fauna and Flora all on the same day.Doing RaDAR you learn to leverage off of other activities going on at the time. Propagation conditions for my ops were better than expected. I was also pleased that Julian OH8STN, Tom G0SWB, Mickey NY2MC, Scott ND9E, and Rubin AC2RJ among others practiced RaDAR in unique ways. Some others just could not make it out. We all look forward to the July 15th RaDAR Challenge. Of course, it is unbearably hot then in Florida. The tables will be turned.